The Active Backpack II is a structurally sound, high-capacity yet compact rucksack that can also be used as a standard daypack. 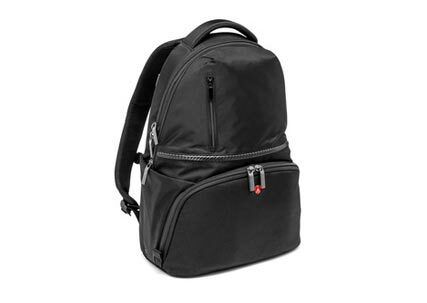 With its capacity to hold a DSLR system with 3-4 standard lenses, 17” laptop as well as personal items and accessories, this rucksack will get you through a gig or a family walk in the park. 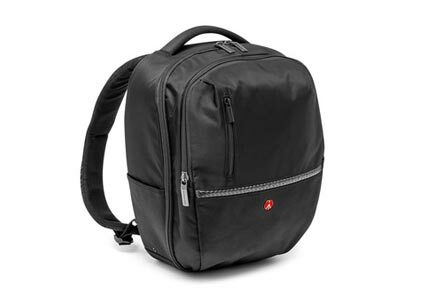 The bag has four zippered compartments with the top part designed for personal items and the bottom for photo gear. Plenty of accessories will fit inside including a flash, large laptop, documents and iPad. 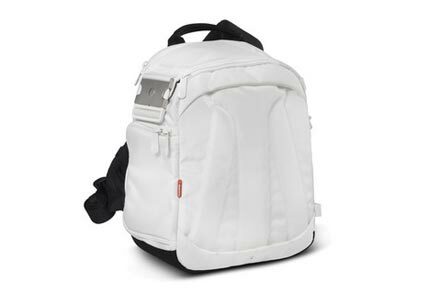 A removable bottom insert allows you to transform the rucksack into a handy daypack. 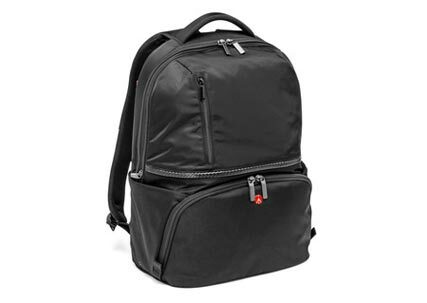 This is a very useful, everyday bag that is strong yet flexible enough to meet the needs of anyone who wants to carry a wide variety of photo gear and personal items. The Active Sling 1 is designed to carry and protect a DSLR camera with attached zoom lens plus up to 2 additional lenses and flash. It will also hold a Mini HDV camcorder and accessories. 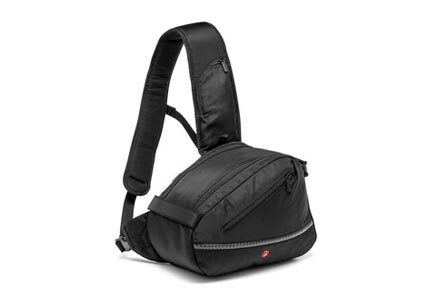 It keeps the DSLR camera in quick-draw position at all times and it can be carried either on the back or on the torso and simply switch from one position to the other by swinging the bag from back to front to grab the camera for shooting. The main compartment will hold a small to medium size DSLR camera body with attached zoom lens in top grip position. Use the padded dividers to create compartments alongside the main camera set-up for additional lenses, flash or other accessories. There is a flat large external pocket which is perfect for personal effects . 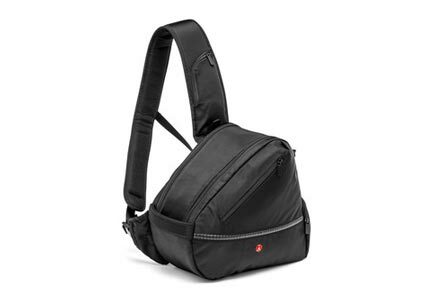 It is carried by an attached, heavily padded adjustable shoulder strap. The Gear Backpack M is a compact, functional and ergonomically designed pack that more than holds its own against similar sized packs on the market. This pack can accommodate your Pro DSLR system with attached 70-200mm f/2.8 lens. In addition it will store other 2 lenses as your 16-35mm f/2.8 zoom as well as a 100mm macro. Access to the pack is easy using the dual zippers to open it and expose the entire contents. Inside the front lid are organizer pockets for small items like media and business cards, cleaning cloths, phone, wallet, pens, cables and LED lights. 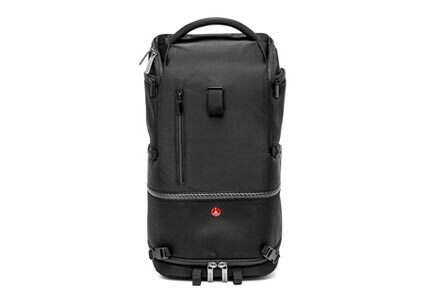 The Gear Backpack S is a compact, functional and ergonomically designed pack that more than holds its own against similar sized packs on the market. This pack can accommodate your Pro DSLR system with attached standard lens and additional two lenses, like a small zoom lens 24-70mm f/2.8 and a standard 50mm f/1.4. Access to the pack is easy using the dual zippers to open it and expose the entire contents. Inside the front lid are organizer pockets for small items like media and business cards, cleaning cloths, phone, wallet, pens, cables and LED lights. The Tri Backpack L provides 3 ways to store, carry and use your gear. You may use it in the backpack, sling bag or “X” position. 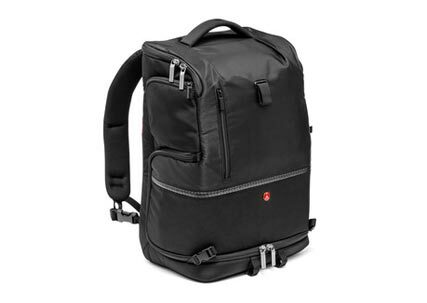 Suitable for your pro DSLR with battery pack and attached long-range zoom plus 5-6 additional lenses, flash and accessories; media card storage and space for 15'' laptop. The unique design of this pack allows you to access your gear even with the traditional backpack shape. In the backpack or ''X'' position with the straps across your chest you can easily and quickly swing the pack to your left or right side by simply releasing the quick release buckles. This means you don’t have to remove the entire pack to retrieve gear. The pack is essentially divided in half with the bottom half for your photo gear and the top half for other items. It is slim and efficient in design. The main camera compartment comes with modular padded dividers that give you the freedom to arrange the pack to suit your gear needs. The top compartment can also be used to store less frequently needed gear. There are two external zippered pockets that allow you to retrieve accessories without having to open the main compartments. The front of the pack contains tripod straps that can accommodate a small field tripod. The Tri Backpack M provides 3 ways to store, carry and use your gear. You may use it in the backpack, sling bag or “X” position. Suitable for your pro DSLR with battery grip, attached mid-range zoom plus 3-4 additional lenses, flash and accessories; media card storage and space for 11'' laptop or tablet. The unique design of this pack allows you to access your gear even with the traditional backpack shape. In the backpack or ''X'' position with the straps across your chest you can easily and quickly swing the pack to your left or right side by simply releasing the quick release buckles. This means you don’t have to remove the entire pack to retrieve gear. The pack is essentially divided in half with the bottom half for your photo gear and the top half for other items. It is slim and efficient in design. The main camera compartment comes with modular padded dividers that give you the freedom to arrange the pack to suit your gear needs. The top compartment can also be used to store less frequently needed gear. There are two external zippered pockets that allow you to retrieve accessories without having to open the main compartments. The front of the pack contains tripod straps that can accommodate a small field tripod. The Tri Backpack S provide 3 ways to store, carry and use your gear. You may use it in the backpack, sling bag or “X” position. 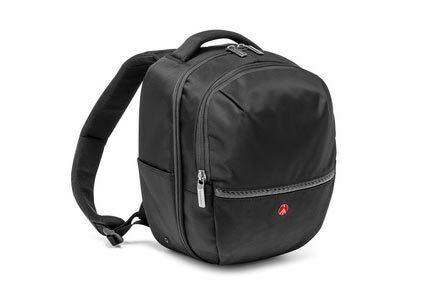 Suitable for your DSLR with standard lens attached, 1-2 additional lenses, flash and accessories plus media card storage. The unique design of this pack allows you to access your gear even with the traditional backpack shape. In the backpack or ''X'' position with the straps across your chest you can easily and quickly swing the pack to your left or right side by simply releasing the quick release buckles. This means you don’t have to remove the entire pack to retrieve gear. 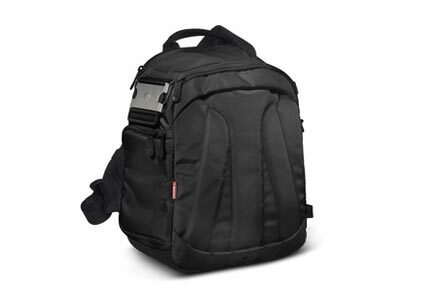 The pack is essentially divided in half with the bottom half for your photo gear and the top half for other items. It is slim and efficient in design. The main camera compartment comes with modular padded dividers that give you the freedom to arrange the pack to suit your gear needs. The top compartment can also be used to store less frequently needed gear. There are two external zippered pockets that allow you to retrieve accessories without having to open the main compartments. 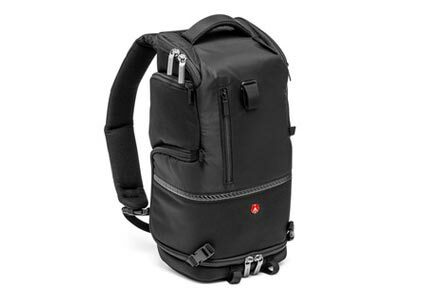 The front of the pack contains tripod straps that can accommodate a small size tripod. The Agile I Sling is the perfect bag for on-the-go shooters. Designed to always get you to the perfect shot with all your gear, it fits a DSLR with up to 18-105 mm lens attached plus 1-2 extra lenses. This bag will provide quick draw whenever called for by simply swinging from back to front. The Agile I Sling (Cord) is the perfect bag for on-the-go shooters. Designed to always get you to the perfect shot with all your gear, it fits a DSLR with up to 18-105 mm lens attached plus 1-2 extra lenses. This bag will provide quick draw whenever called for by simply swinging from back to front.